Everyday human actions often occur in a social context. Past psychological research has found that the motor behavior of socially situated individuals tends to be coordinated. Our research performed over the last 20 years has sought to understand how the mutuality, accommodation, and synchrony found in everyday interactional coordination can be understood using a dynamical theory of behavioral order, namely coordination dynamics. Using laboratory interpersonal tasks, we have demonstrated that when two people are asked to rhythmically coordinate their limbs they show behavioral phenomena identical to those found in bimanual interlimb coordination, which has been mathematically modeled as a dynamical process. Research has demonstrated that these same dynamical organizing principles can coordinate the rhythmic movements of two people unintentionally and that the weaker, intermittent coordination that ensues is affected by both perceptual (e.g., attentional focus and information pickup activity of the visual system) and dynamical constraints (e.g., intrapersonal rhythmic synergies and period basin of entrainment). 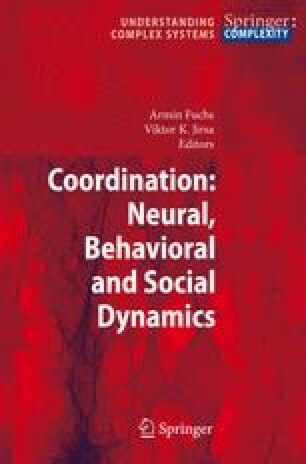 Other research has investigated how traditional social and personality properties of a dyad (rapport, social competence) relate to dynamical properties of a dyad’s coordinated movements and how the stability of coordinated movements mirrors the stability of mental connectedness experienced in social interactions.